This section is stocked with a wide range of watch & clock tools, including tools to open, close and even replace parts of watches. Please use the menu here to search more specifically for a certain tool. 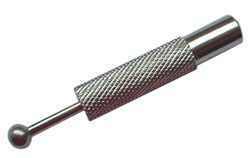 If you are unable to find a tool you require please let us know and we shall try and supply this tool for you. Handy little tool for opening screw back watches. Very convenient with its compact size. Designed perfectly for the opening of clip on watch backs. 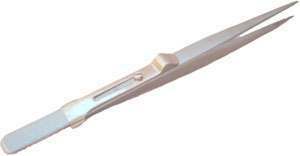 Used for opening oyster-shaped cases made by Rolex. Includes the wrench and six dies in the appropriate sizes: 18.5, 20.2, 22.5, 26.5, 28.3 & 29.5 mm. Helpful tool for safely removing watch backs and crystals. 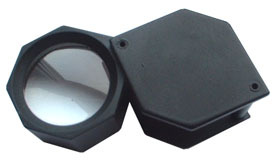 Measuring approximately 114 mm in length, the rubber tip will not scratch cases or crystals. Helpful tool for safely removing watch backs and crystals. It measures approximately 50 mm in diameter. Made of rubber, so will not scratch cases or crystals. Double sided to accommodate different sized watches. Features millimeter scale on the handle. Efectively measures, removes and inserts watchband spring bars. 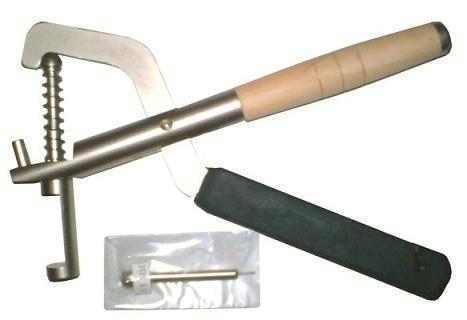 Quality steel spring bar remover, removes and inserts watchband spring bars. Tempered steel removable narrow fork (1.0mm) at one end and fine push-pin (0.8mm) at the other end. 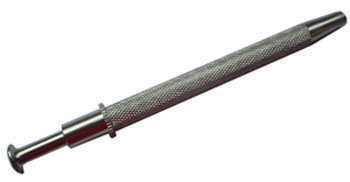 Quality steel spring bar remover, removes and inserts watchband spring bars. Large fork(4.0mm) at one end and reversible narrow fork (1.2mm) and fine push-pin (0.8mm) at the other. Handy little tool for removing pins from metal link bands. 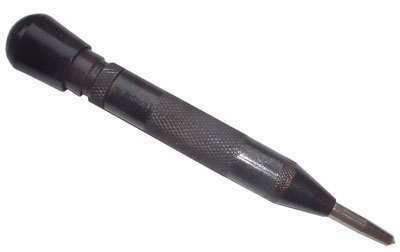 The pushing pin is a hardened steel. Will not mark gold silver or base metal. Body is made from aluminium for extra strength. Kit for watch bracelet metal and some leather straps pin remover, Includes small ball head hammer, watch strap holder, handle for pins and three different pins. The pushing pins are hardened steel. Watch case closers made of quality strong heavy steel, has two rubber black pads to avoid scratching watch. Watch back case press comes with twelve nylon dies which are designed to not scratch or mark the glass front. Made from heavy metal to give it extra strength for stubborn watch backs. This case back press has facedown configuration so that the repair person can see the back being closed. Mainly recommended for professionals. JAXA Watch Case Opener - Link Pin Remover - knife Watch Case Opener - Spring Bar Remover Tool - Screwdriver Set of 5 Phillips - Screwdriver Set of 7 - Sharp point tweezers. A Super little tool set, put together specially for opening up watches and cleaning them or changing the batteries. Can also be use to do certain repairs. The set includes a small screwdriver, AA quality sharp end tweezers, a pocket screw case opener, a dial & cleaning brush, non scratch plastic tweezers, a pocket thumb case opener, a knife case opener and a pair of chain nose pliers. Also comes alltogether in a yellow wallet. Screwdriver set of 5 - File set of 6 - Large screwdriver - Cleaning brush - Knife case opener - 4x mag eyeglass - Rubber blower - Movement holder - Flat nose pliers - Strap cutting pliers - Tweezers x 2 - Swiss style hammer - Peg wood bundle - Oil stone - Oil cup - 36 hole rivertting stake - Set of 12 punches - Strong adhesive. 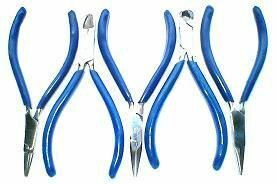 Large pliers at 8.5 inches long with good strong grip for tough hole puching. 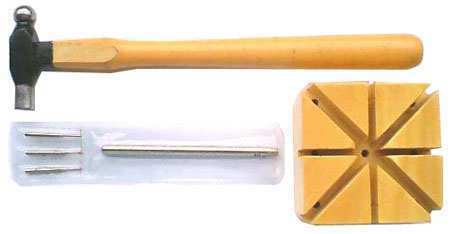 Must have tool for resizing wristwatchs, this tool punchs holes in leather or plastic straps. made of quality strong steel. Punches holes 2mm, 2.5mm, 3mm, 3.5mm, 4mm and 4.5mm. Stainless steel cutter for notching watchstraps. 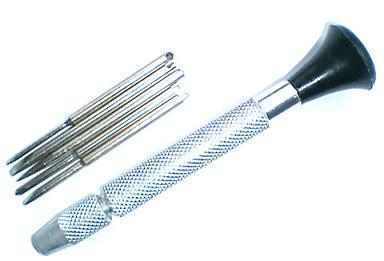 Popular set of screwdrivers perfect for watch makers. Has seven colour coded hex screwdrivers. Blades are tempered and finely ground to exact specification. 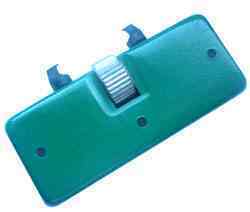 Also has a set of seven replacement blades which are changed by reversing the blades. These tweezers have good strong corrugated points. 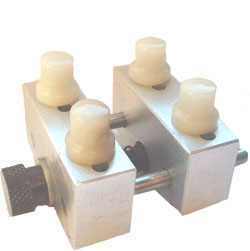 Slide locking mechanism that is worked using the thumb for easy one hand operation.. These tweezers have good strong sharp corrugated points. made for a very good grip. 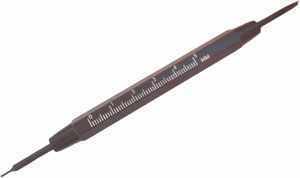 6 inch tweezers with strong sharp corrugated sharp points. Has shovel on the end for picking up diamonds or other small parts. 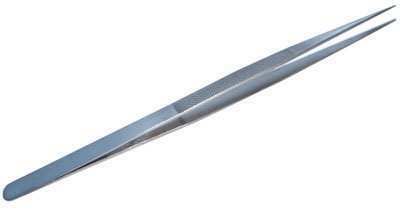 These stainless tweezers have multi-uses such as jewellers and watchmakers jobs but are specially made for soldering they have fiber grips on eaither side so when the tweezers heat up they will not burn your hands. They measure 6.5 inches long. The tip bends downwards to make picking up small objects easier. 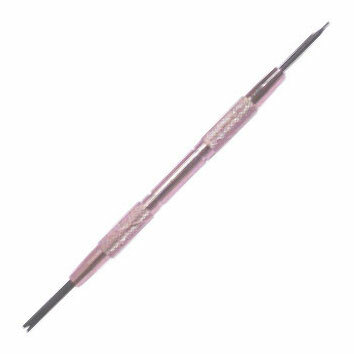 These stainless tweezers have multi-uses such as jewellers and watchmakers jobs but are specially made for soldering they have fiber grips on either side so when the tweezers heat up they will not burn your hands. They measure 6.5 inches long. The tip are straight. 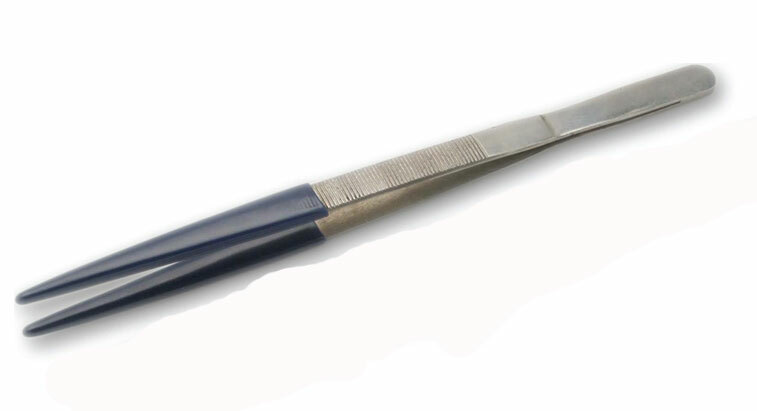 Stainless tweezers have multi-uses for jewellers and watchmakers alike. Straight end. Tweezers are pressed to open and relased to close, making it easier to hold things. They measure 6.5 inches long. Stainless tweezers have multi-uses for jewellers and watchmakers alike. Straight end and blunt cut for strong grip. Tweezers are pressed to open and relased to close, making it easier to hold things. They measure 6.5 inches long. For use with steam & ultrasonic cleaners. 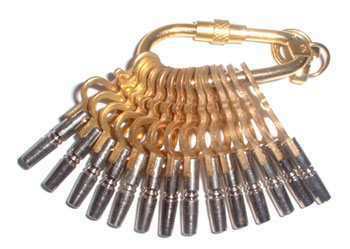 PVC plastic-coated tips offers heat and chemical resistance, and also a secure grip on your jewelry items. Plastic coating is blue, length is 8" (20cm). Perfect for picking up small stones and also perfect for watch makers for picking up small screws etc. When end is pushed 4 prongs come out. Perfect for picking up small stones and also perfect for watch makers for picking up small screws etc. When end is pushed 3 prongs come out. Heavy round base third hand for holding tweezers to hold items while working, perfect for small soldering jobs. Ideal with slide or self locking tweezers. 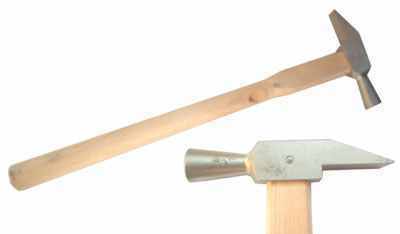 Durable construction, a hardwood handle and large thumbscrews, make this a well balanced and designed saw. (Blades sold separately). 1 Gross spare saw blades for the above saw and other adjustable saws. 100 blades on average to a pack, may vary slightly. 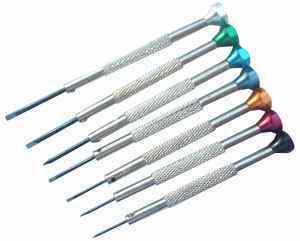 6 different sizes (1/0), (2/0), (3/0), (4/0), (1) and (2) for fine jewellery and clock repairs. 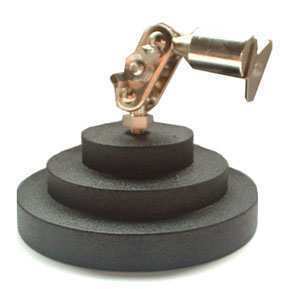 A superb quick acting tool for removing all types of hands from watches. The tool is activated by pushing downwards on the plunger. 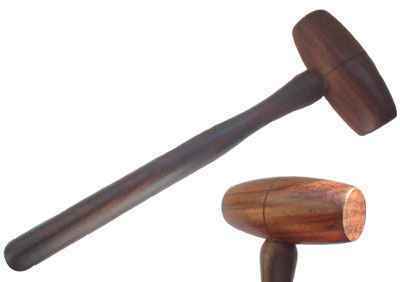 Has a center post acting as a guide and also holds the hands after they have been removed. 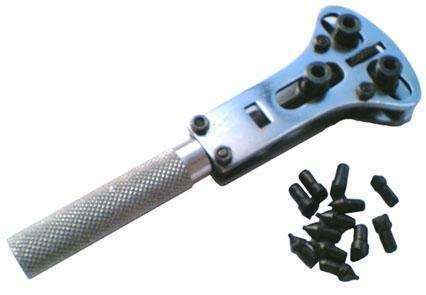 Adjustable metal frame and postition pegs make this tool perfect for holding small and odd shaped items during repair. Good tool for watch repairs. 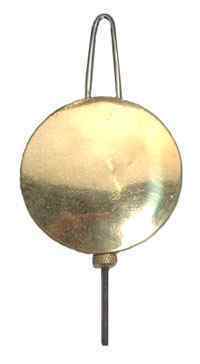 Solid brass case-holder - one arm version. With fine brass finish, lightly lacquered for protection. Adjusts for various movement sizes and pocket watch sizes up to 55mm. Can clamp onto a top winder pocket watch, but works particularly well with a pocket watch that has a side winder located at 3 o'clock. Solid brass case-holder - two-arm version, clamps to each side of the watch,and adjusts for various movement and pocket watch sizes up to 55mm. Works particularly well with a pocket watch that has a top winder located at 12 o'clock. Set of six of 14cm files of different shapes. Best used with a needle file holder (see below). 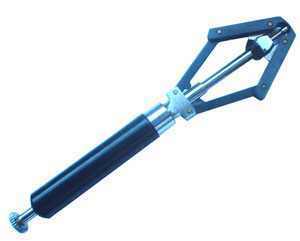 Easy to hold triangular plastic handle with brass adjustable chuck. 110mm overal length. 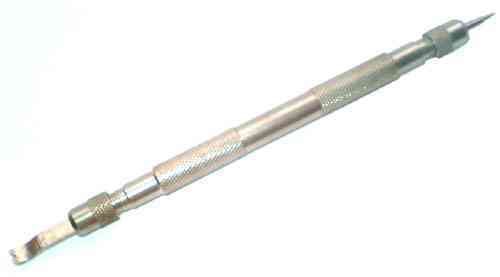 Ideal for needle files (above) and other tools with shaft diameter around 3mm. 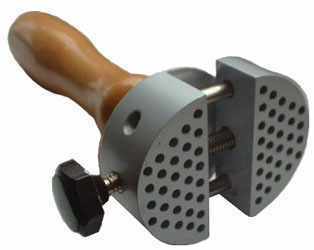 Perfect finish and five sided to use like a hand twist file to enlarging and align holes before tap and die. Made of high carbon cutting steel. Set of 12 assortment sizes. 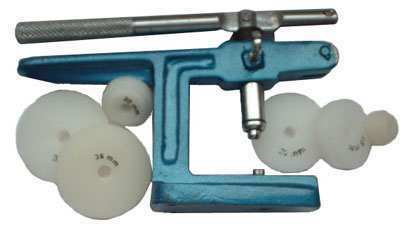 Accurate punch quality, designed to work smoothly and effectivly. No need for a hammer. 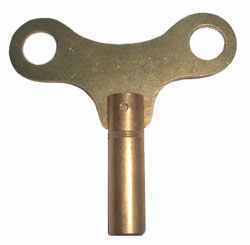 When pressed against the workpiece, this punch stores energy in a spring, eventually releasing it as a reproducable impulse that drives the punch. 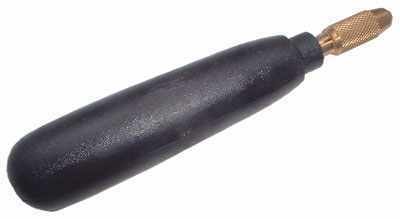 Tip is made of heat-treated steel. Smooth flow of air with metal nozzle. has valve at the top to control the air flow. 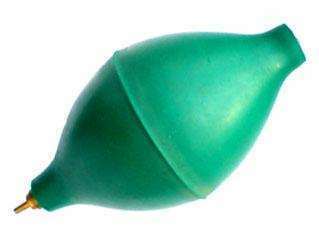 Made from the finest quality rubber to make the blower soft. Ideal for working on watches. 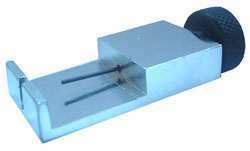 Pin vise with rotating plastic ball head approx 9cm long. Comes with two collets to accomodate bits up to 2.5 mm. 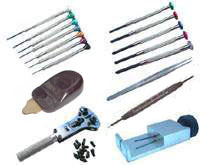 Holds drill bits, burs, files, screwdrived blades, reamers and more. 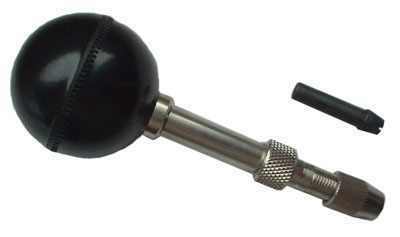 Overall length of 120mm with durable plastic body and brass three-jaw keyless chuck. Accomodates bits up to 0.9 mm. 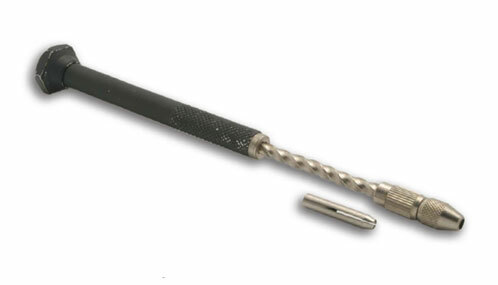 Hollow handle with screw top for storage of drill bits. Great for drilling into wood, soft metal and plastics. Perfect for wire twisting. Overall length of 185mm with black aluminium body and two collets accomodating bits up to 2 mm. Archimedes drill turns when you push down on the body. 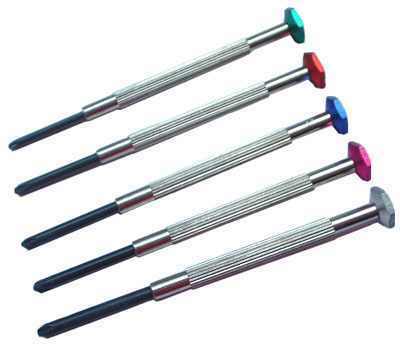 Perfect for drilling of PCBs. 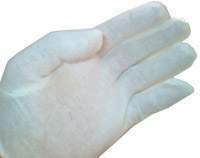 A pair of soft white cotton gloves. Sufficiently thin for fingertip sensitivity, sufficiently thick to abrorb moisture and oils and protect your work. Unisex and 'one size fits most'. 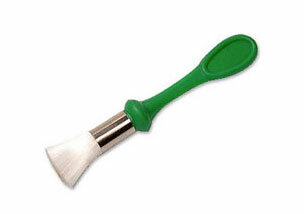 Brush for dial cleaning with plastic handle with soft nylon bristles. Overall length of brush is 110mm. Bristles measure 22mm x 12mm in diameter. Designed for cleaning delicate watch dials, but with dozens of other uses. Glass Fibre Pencils can precisely clean and abrade plastic, wood, metal and other common materials. Propelling pencil action exposes more of the glass fibres so you can lengthen the fibres for a more delicate abrasive action. 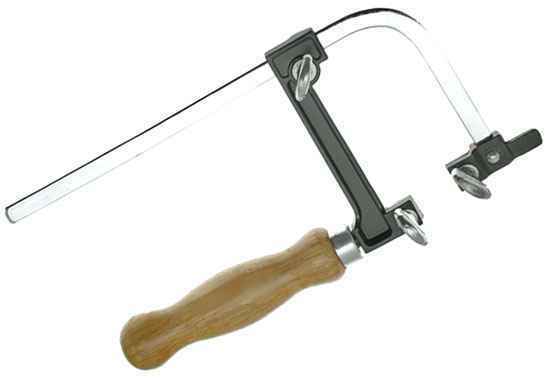 Jewellers riveting hammer, small and handy. Used for reveting, shaping etc. Perfect for small delicate hammering jobs. One end is flat and the other is chisel shaped. Mounted on hardwood. Made from quality natural wood. 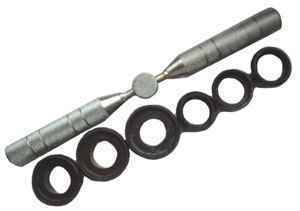 Used for removing dents and straightening & flatening metals. Stainless steel bracelet band, solid, with adjustable safety clasp. Links can be removed by pushing the pins in the strap.